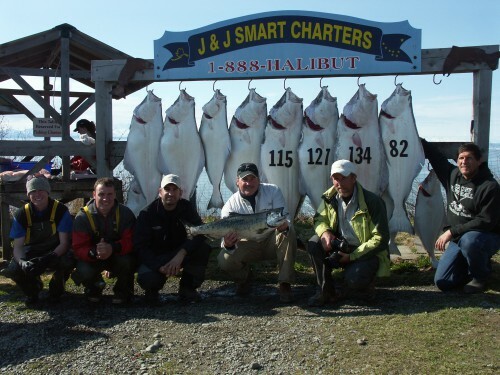 Enjoy a day of halibut and salmon fishing out of Cook Inlet aboard our 28-foot Alumaweld boats. The Coast Guard licensed Charter Captain will meet you and your fishing party at Deep Creek View Campground at the time determined when you book your charter. You will fish for King Salmon either before or after your halibut trip, depending on the tide that day. We provide the fishing gear, bait, hot coffee, and transportation from the campground to the beach of Deep Creek where the boats are launched (a unique experience in itself!). The captain gives a safety briefing once everyone is in the boat and seated. After your trip, we bring you back to the campground to hang your catch for those memorable Alaskan photos. View photos from our previous trips in our photo blog. Then the captain and deckhand fillet your fish. Commercial vacuum sealing and freezing are available at the campground, as well as ice. And businesses in Ninilchik offer UPS and FEDEX shipping for your fish. Local bed & breakfasts and cabins: Both Soldotna, 30 miles to the north, and Homer, 30 miles to the south, offer several choices for lodging. Check out the Anchorage Convention & Visitor’s Bureau website at www.anchorage.net for more information.